You have so many options for online shooting videos, and some aren't half bad. But there is only one Online course, not just a video, that was professional recorded and produced by a basketball coach and trainer of NBA Lottery Picks, NBA Finals MVPs, Olympians and entire international professional and national teams. 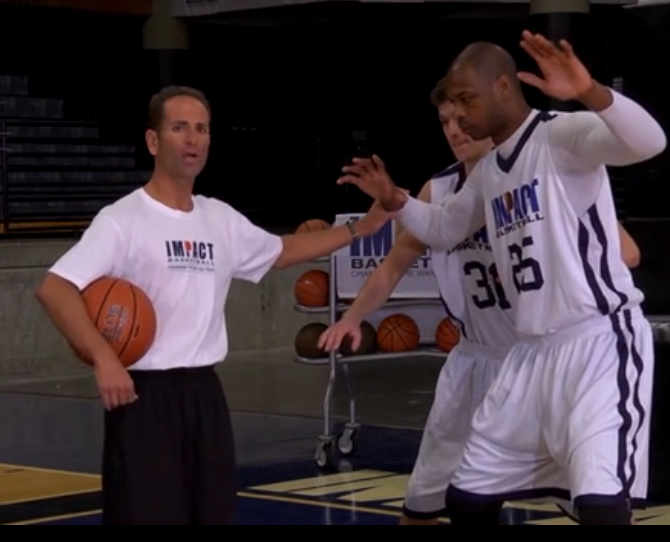 Joe Abunassar, the Founder and President of IMPACT Basketball, is a pioneer in basketball player development and he has professionally packaged up his teaching to get you ready to shine. Every spring, the very top college and international basketball players flock to Las Vegas for Joe to get them ready for the NBA draft - fine tuning their mechanics, getting them balanced and ready to be picked apart by the scouts. Every Summer, many of these same greats return for more help, often 10, even 15 years into their NBA Championship winning careers. Every NBA Season, Joe and members of his staff are asked to help fix an NBA player's shot, even though they are going to start in the All-Star game or are headed to the Hall of Fame. All year round, young club, high school and post-graduate student athletes enroll in IMPACT's Academy, Camps and Clinics to learn what it takes to get the most out of their potential. Because Joe's 20+ year track record as both a professional basketball coach and elite player development trainer has created a teaching system and philosophy that enables them to produce results at the highest level. Team USA & Toronto Raptors NBA All-Star Kyle Lowry improved his 3 point shooting percentage by 56% since he started working with Joe. 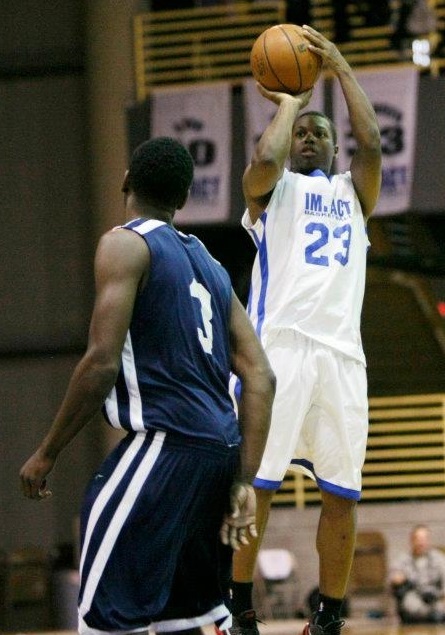 NBA All-Star & IMPACT player Kyle Lowry working on his jump shot during summer scrimmages in Las Vegas. Read how hard Kyle Lowry and Kawhi Leonard had to work and the importance of finding time to train during the season and making the most of the off season. Now you can learn from Joe the same way he teaches NBA Champions & Finals MVPs Kawhi Leonard & Chauncey Billups, Olympians Kyle Lowry & Demarcus Cousins, and international superstars like Serge Ibaka & Kristaps Porzingas. Watch & Compare For Yourself. No doubt, you have seen plenty of YouTube videos, most are poor quality and offer incomplete advice from unproven "coaches and trainers." You may have invested in a DVD package too. That's great, as you will have something to compare the Shooting PLUS value. Watch and see just how detailed this course is as Joe shows Pat how to step into a shot and teaches you not only how, but also why you these fundamentals work and matter. 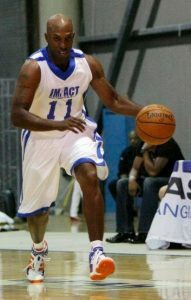 You'll also notice the professional quality audio and video from days of recording at the IMPACT facility in Las Vegas. Click the Play button to watch just one of the over 300 videos included in the Shooting PLUS program. What's Included In the Shooting PLUS Course? You'll start by learning the Key Elements of Shooting like balance, footwork, hand and elbow placement, where to focus and the importance of rhythm in playing and training. From there, you'll move onto Spot and On the Move Shooting, including Curl, Flare/Fade, Pop and Trail Cuts drills that you can put into your game immediately. Scoring is more than Shooting Technique. you'll need to fill the stat sheet. To really fill up that stat sheet, you are going to need to make your own shot and Joe teaches how to do just that in this module. From Scoring Off the Dribble, including videos teaching the Euro Step, Runners, and Goofy Foot moves, to scoring in transition thanks to changes in direction and speed, everything you need to start scoring in bunches is included. Be prepared to take advantage of any size or strenght mismatch you're presented with, at any position. In this module, you'll learn all about court and body positioning, how to properly determine your next move and then how to score. You'll learn how to establish position, and 11 moves in the low post, plus 9 more from the mid-post. Also covered is how to vacate the post and get a shot, and the essential Ball Screen Action so critical into today basketball. STILL HAVE QUESTIONS OR JUST WANT TO TALK TO A LIVE PERSON?